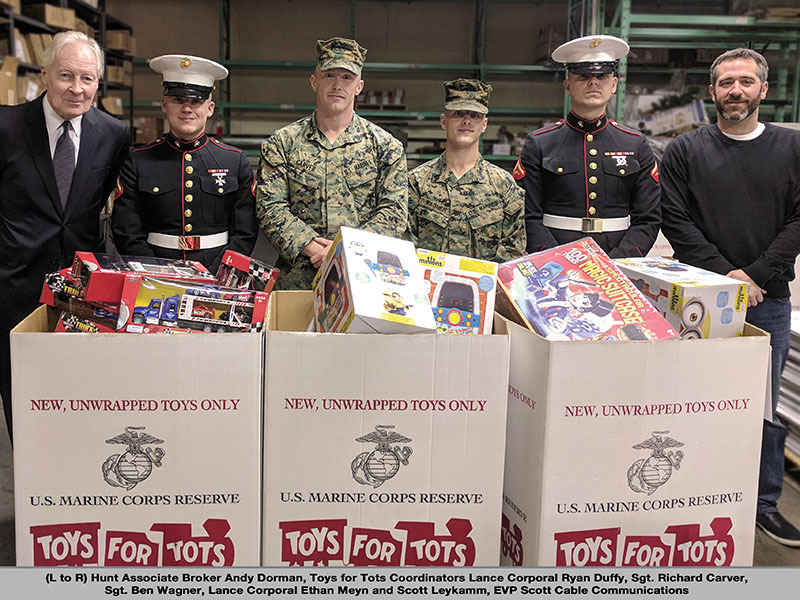 Shown (from left) are: Andy Dorman, associate broker at Hunt; Toys for Tots coordinators lance corporal Ryan Duffy, sgt. Richard Carver, sgt. Ben Wagner, lance corporal Ethan Meyn; and Scott Leykamm, exec. VP of Scott Cable Communications. Plainview, NY For the fourth consecutive year, Hunt Corporate Services Inc. arranged for the Marines to land a central collection depot for their annual Toys for Tots campaign. Scott Cable Communications of Farmingdale is providing the Marines with warehouse space at its 90 Hudson St. building in Copiague. “When Andy came to us with a request to provide space for the Marines, we simply could not refuse,” said Scott Leykamm, executive vice president of Scott Cable Communications. “Many in our extended family are veterans, and we know too well what veterans have sacrificed for the sake of our country. It’s just an honor to be involved,” said Leykamm. Toys for Tots was started 70 years ago by a Marine reserve officer and has since become one of the world’s most visible charities. In 2016 alone, for example, Toys for Tots gave over 16.8 million toys to seven million less fortunate children. It continues to be a top-rated charity, which means over 97 percent of donations actually go to the needy, while only three percent is spent on fundraising and overhead. Former First Lady Michelle Obama recently had been one of the charity’s most visible supporters. Over the years, Toys for Tots spokespersons included John Wayne, Bob Hope, Frank Sinatra, Clint Eastwood, and Brooke Shields. To donate a toy: Simply go to www.toysfortots.org, and find a drop-off location. The drop-down menu labeled “Select a State” will guide you to your local Toys for Tots campaign, in this case, Farmingdale, NY. The local campaign also has a phone number: 631-962-1773. If you prefer to make a financial donation, again go to www.toysfortots.org and find your local Toys for Tots campaign. At the local website, each visitor may also find information about local events, how to become a collection point for the local campaign, how to register for assistance, and how to donate directly to a local campaign.